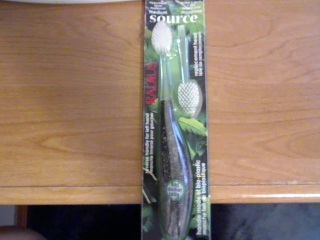 I was sent the Radius tooth brush to try and review. 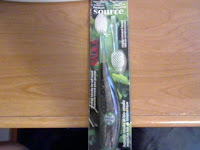 My tooth brush is made of money..Is yours?..No seriously..My tooth brush IS made of money..old dollar bills to be exact! I was given the chance to choose which tooth brush I wanted to review. There was a few choice toothbrushes I wanted to try such as the flax toothbrush but when I seen this tooth brush was made from dollars I knew this would be an interesting review! This radius has a larger head then other tooth brushes I have previously owned. It comes with a replaceable head..Which in my opinion is a great option! the tooth brush is made in the USA which I love that. The tooth brush is reversible so if you are a lefty or righty then it's perfect for you. Radius s CrueltyFree (Does not test on animals) Bio-Plastic handles are made from recycled dollar bills, flax, wood, and plastic. 93% of waste eliminated by replacing only the surgical grade nylon head. Premium Radius HEX bristles with a radiating design help accurate and effective brushing. ♥ I receive no monetary compensation for this review. I was provided a tooth brush to try and give my honest opinion.